It was another beautiful day in Whistler - sun, blue sky and warm enough for only one layer! We drove up to the Whistler Sliding Centre where the bobsled, luge and skeleton was held during the 2012 Vancouver Winter Olympics. It was closed until the winter season so we could only walk around the outside. But, we could still see the track and all the scrapes around the corners. The track is still used in the summer. They put wheels on the bobsleds and the public can have a go after instruction from a professional driver. That would be fantastic to do but the summer season had finished. 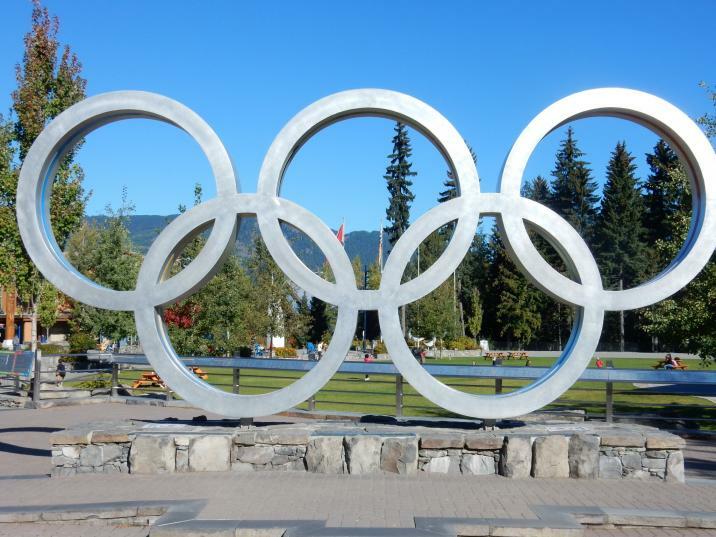 We also went to the Whistler Olympic Park which is about 15mins south of the village. Within a minute or two of turning off the highway, we saw a small black bear eating the grass at the side of the road. There was nowhere to stop and there were cars behind so we could only look at him as we went by. The Olympic Park is where the ski jumps are that were used during the Olympics. They looked so steep and seemed to have so little room to stop after the jump. We also saw the area where the Biathalon shooting was done. The targets were still up and there were heaps of bullet casings lying on the ground. This is also used in the summer. You can come and learn how to shoot the rifle then have a go at the targets. I would have loved to do that but it finished in early September. We went back to the village and walked down the other end where we hadn't been yet. We also saw the Olympic Rings which were down in the plaza. We were booked onto a bear viewing tour this afternoon. We booked the tour on Saturday when we arrived. I had looked at the tour before we left Sydney but I didn't book it because I didn't know what else we would be doing. When we went into the Visitor's Centre, there were 3 or 4 different brochures. I told the girl I wanted to do the Michael Allen tour as he is a bear expert. She said she wasn't sure which one it was and suggested we do a particular one because they go to a different spot where there are lots of bears. We got picked up in a landrover and headed to the exact same spot we had seen the bear today. The driver told us about a small yearling black bear she had seen earlier today. It must be the same one we saw. A bit further up the road we saw a brown coloured black bear eating by the side of the road, we stopped and watched him for a while. He was working his way down to the highway so we turned around a few times and swapped seats in the car so everyone got a good look. On the way back up, Robyn spotted a black bear on the side of the road. We watched him for a while but he didn't seem as comfortable with us there as the brown bear had. After that we went to a waterfall and into the forest where we saw a deer but no more bears. I am disappointed I let myself be talked into this tour. We could have done all of that in our own car.